Angela Jackson | Celebrity Speakers Intl. Author of the best-seller Celebrating Anger: Creating Solutions for Managing Conflict At Home, On the Job, In Relationships. “Uplifting” “Outstanding” “Warm” “Witty” “Inspiring!” These are some of the phrases that conference attendees use to describe Angela Jackson. Using humour, life stories, and audience participation, Angela motivates people to take responsibility for their lives and turn the negatives into positives. A dynamic keynote speaker and extraordinary trainer, Angela delivers high energy, customized programs on conflict management, communication, team building and personal motivation. She has been a featured guest on Geraldo and the Shirley Show and is a regular contributor to radio and print media. If you want a speaker that can motivate your mind, open up your heart, and produce lasting results, then Angela Jackson is the speaker for you! Dynamic speaker, seminar leader and author, Angela Jackson has appeared on the “Geraldo” and “Shirley” shows, and has been featured in several magazine articles. 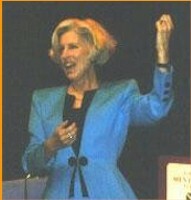 Audiences across North America know her as a caring, inspirational speaker, committed to making a difference in how people relate. Angela delivers presentations on Handling Conflict, Managing Stress, Maximizing Self-Esteem and Bringing Laughter and Joy Back to the Workplace. Her first book, “Celebrating Anger” has recently become a Canadian best-seller.